This card started out as a failure but I'm really happy with the progress it made! 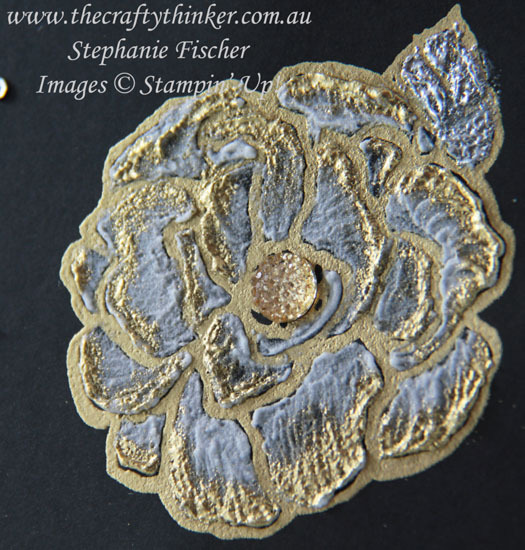 I "painted" inside the gold heat embossing with white Embossing Paste and sprinkled on some Embossing Powder while it was still damp - gold on the petals and silver for the leaf. There's a Gold Faceted Gem for the centre of the flower and a scattering of silver sequins from the Metallics Assortment. On top of the base card, there's a fairly wide border of Silver Foil Sheet. Embossing paste is a little tricky to manoeuvre, especially in small spaces, so I applied the paste with a small brush. I sort of plonked it in the petal with a bit of a twist motion and then used the brush to spread it out, adding a little more if needed. I tried to pull the paste from the outside of the petal inwards and leave a few brush marks to give some depth and definition. 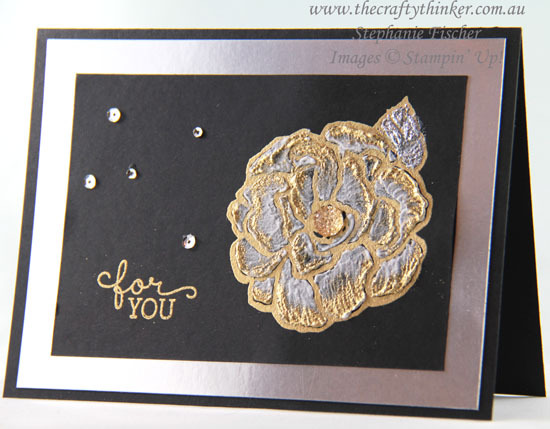 I started with a gold heat embossed flower. My first challenge was that my embossing paste had gone quite dry (there wasn't much left in the pot!). However, I scraped some out with a palette knife and mixed in a few drops of water in a small glass dish and it became quite workable. I thought my brush would be a write off afterwards BUT I rinsed it off after each petal and gave it a good wash at the end and I'm happy to report that it has suffered no damage! Despite all my care, it was inevitable that I would get some embossing paste onto the gold lines of the flower. While the paste was still damp, I simply used a small damp brush to clean along the lines. I worked one petal at a time, applying the paste , sprinkling on the embossing powder, tapping off the excess and using my brush to draw the powder down the petal a little. I only used the heat tool at the end. To apply embossing powder into small areas I keep plastic straws in my craft room. I've cut fairly short lengths at a bit of angle (a bit like a nib). I hope you like this technique and card. I also made a shimmery butterfly which I'll share with you shortly.